German director, Roland Emmerich, the man behind such spectacles as Independence Day and The Day After Tomorrow is set to destroy the world again with his latest action flick, 2012, which opened worldwide yesterday. The Mayans believed the world would come to an end in 2012 and the director says "maybe" in this movie. In this latest catastrophe, the earth's core is hit by a huge solar storm which leads to the seas rising, volcanoes erupting and the ground moving. People struggle to survive, including failed writer Jackson Curtis, played by John Cusack. Amanda Peet plays his ex-wife who joins him in his singular bid to save his family. Like the director's previous works the special effects, presided over by the co-producers and digital effects supervisors Volker Engel and Marc Weigert, in 2012 are simply breathtaking. 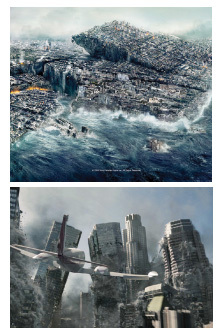 The US$200 million production has cities sinking, and people clinging to falling skyscrapers, among other frightening doomsday scenes. This sci-fi adventure, starring Nicholas Cage as an astrophysicist who decodes terrifying predictions about the future and races to save the world from cataclysm, is directed by I, Robot helmsman Alex Proyas. This thriller is a remake of the 1974 original and is directed by Tony Scott. John Travolta plays opposite Denzel Washington as the criminal mastermind Ryder, who hijacks a New York city subway train in exchange for a huge ransom from the government. Washington stars as track controller Walter Garber, who tries to save the city. One of Asia's most popular cartoons takes to the big screen for the first time. The film tells the tale of a young robot's journey in search of human acceptance. The final work of the King of Pop, made from more than 100 hours of rehearsal footage for his planned London concerts, shows an enthusiastic Michael Jackson crafting his moves and performing some of his most beloved hits. Directed by Kenny Ortega.